A frequent question we receive about OS X is “How do I change my short username?” While it's easy to change your full username—an easily-accessible setting in the Users & Groups pane of System Preferences—there’s no obvious way to change the short username, which is also the name of your home folder in the Finder. 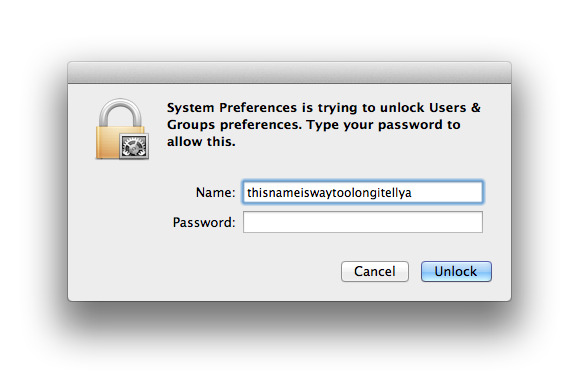 Prior to Mac OS X 10.5 Leopard, changing your short username was a complicated, risky procedure. In fact, it was so complex that even Apple’s own instructions weren’t exhaustive. Because of this, a colleague and I wrote a special utility for pre-Leopard versions of OS X, ChangeShortName, that did the job right. But starting with Mac OS X 10.5, Apple gave users a reasonably simple way to change the short username, right in System Preferences—though it’s not obvious where, exactly, to find it, even in OS X 10.9 Mavericks. Even better, you have three options for making such a change, and though they vary in complexity and risk, all are considerably safer than the unauthorized procedures you had to use in the past. Read on for all the details. Why would you want to change your short username? Maybe you too-casually accepted the OS X Setup Assistant’s suggestion when first configuring your Mac, and your current “short” name isn’t really short—it’s a pain to type every time you’re prompted for your username. Perhaps you’ve got two or more Macs and you want to use the same short username on all of them. Or maybe you inherited a Mac from someone and would prefer to change the name of an existing account instead of creating a new one. Whatever the reason, you just want a change, so we're here to help. Below are the three methods you can use. Note that whichever approach you take, the steps must be performed from an administrative user account. And, of course, you should always have a good backup of your drive before you go mucking around with user accounts. If the main reason you want to change your short username is to reduce how much you need to type in username/password dialogs—for example, when logging in to your account or when performing actions that require administrator authentication—OS X offers an easier solution: account aliases. Like a file alias in the Finder, which refers to an original file and essentially functions as that original file when accessed, an account alias refers to a specific account and functions as that account. For example, if your name happens to be Englebert Rumplestiltskin and the OS X Setup Assistant kindly made your short username englebertrumplestiltskin, you can create an account alias of rumple. Then, wherever you’d normally type englebertrumplestiltskin in OS X, you can instead type rumple. If the lock icon in the lower-left corner of the Users & Groups window is “locked,” click it and provide an administrative username and password when prompted. This allows you to make changes. In the list of accounts on the left, right-click (or Control-click) on the name of the account you want to modify, and then choose Advanced Options from the resulting menu. Although your new account alias may be usable immediately, I recommend restarting just to be sure all of OS X’s services are aware of it. From now on, any time you’re asked for your username and password, you can type your account alias instead of your actual short username. Advantages: Easiest procedure; absolutely safe; can log in and access shares via the alias; few, if any, side effects. Disadvantages: Doesn’t actually change your short username; doesn’t change the name of your home folder in the Finder; File Sharing shares still use your original username; possible (minor) security implications by having multiple login names. The next step up in complexity is to actually change your short username, but to leave your home folder (in the Finder) alone. This approach lets you log in using the new short username, and any OS X dialogs in which your short username is automatically filled will use the new name, but your home folder in the Finder will still reflect your original name. One potential issue to be aware of here: Some programs may store settings or preferences based on your short username. If you change that name, you may find that particular programs, and possibly even some OS X services, exhibit minor issues after making the change. The solution is usually as simple as viewing the settings interface for the offending program or service and changing whatever setting is causing the problem. Log in as a different user than the one you want to modify; also, make sure the account you want to modify is not logged in. Open the Users & Groups pane of System Preferences. Click OK, and then close System Preferences. After restarting, your original short username will no longer be valid; you’ll need to use your new name exclusively. 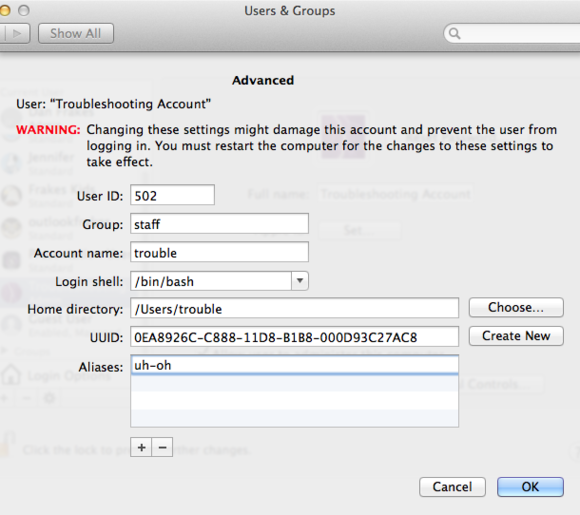 OS X automatically updates any groups to which your account belongs. Tip: If, after changing your short username, you find yourself occasionally typing your original username by accident, you can use the first procedure, above, to add your old name as an alias to your new one. Advantages: Relatively safe; changes your actual short username; avoids problems with preferences and applications that store settings based on the path to your home directory (see below). Disadvantages: Doesn’t change the name of your home folder in the Finder, or the name of File Sharing shares; can cause minor issues with preferences and application that store data or settings based on your short username. If you're offended (or confused) by the idea of your username and the name of your home folder in the Finder being different, or if you want your home directory’s name to match your username when accessing your account over File Sharing, you want to change both your short username and your home folder name. Although this procedure is more complete than the previous one, it has caveats of its own. In addition the issue mentioned above with respect to programs that store settings based on your short username, there are also programs—in fact, more programs—that store settings or preferences based on the path to your home folder. If you change the name of your home folder, that path changes (from /Users/oldname to /Users/newname) and, thus, those settings are no longer valid. However, as with the previous procedure, the solution is usually as simple as viewing the settings interface for the offending program or service and changing whatever setting is causing the problem. A bigger issue, at least initially, is that Time Machine, OS X's built-in backup system, tracks files based on each file's filesystem path. If you change the name of your home folder, the path to every file in your home folder changes, which means that Time Machine will back up every file again. But this will happen only on the first backup after the name change—after that, Time Machine will resume backing up only changes to files and folders. On the Advanced screen, delete your current short username in the Account Name field, and then type your desired new short username. In the Home Directory field, change /Users/oldusername to /Users/newusername, where oldusername is your original short username and newusername is your new short username. Make note of the original and new paths. 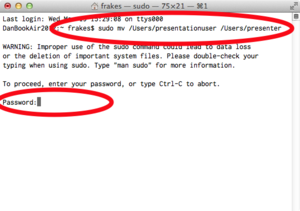 Type the following command, all on one line, and then press Return; when prompted, provide the password of the admin-level account you’re currently using, and then press Return again: sudo mv /Users/oldusername /Users/newusername (These are the original and new Home Directory paths from Step 7; oldusername is your original short username and newusername is your new short username.) This step renames your home folder in the Finder. Quit Terminal, and then restart your Mac. After the restart, your short username is completely changed, at least as far as OS X is concerned—both your account name and the name of your home folder in the Finder have been updated. Advantages: Both your short username and your home folder in the Finder are changed; nearly complete method of changing your short username. Disadvantages: Can result in minor issues with services and applications that store their settings or data based on your short username or the path to your home folder.